Everyone, who has been making a project based on Arduino probably wanted the board to be smaller than the basic unit. A variety of smaller, but compatible with Arduino, boards have been developed. One of them is SparkFun’s Arduino Pro Mini. 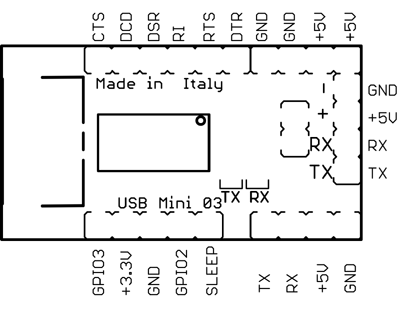 Currently, it has ATmega328 onboard and its dimensions are 33 mm x 18 mm. It’s available in two versions. The first runs on lowered (3,3V) supply voltage, sacrificing clock frequency (up to 8 MHz). 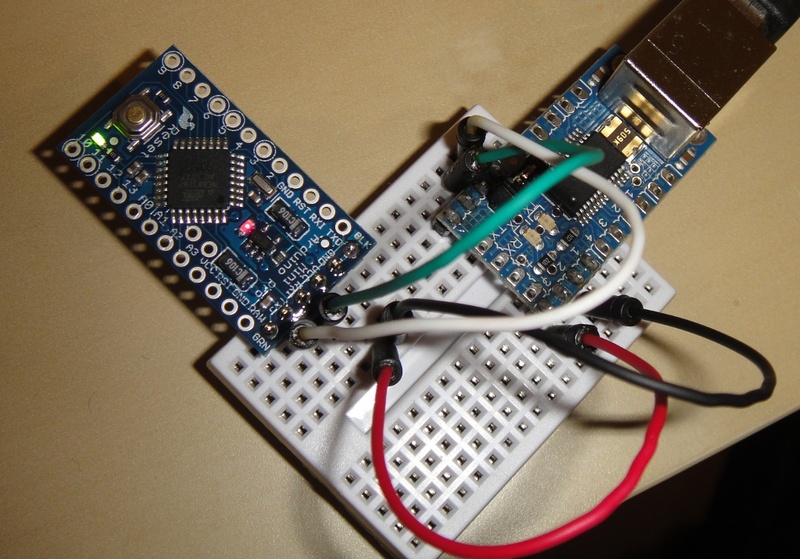 The latter version is a copy of an ordinary Arduino – works with 5V supply and the maximum frequency is 16 MHz. If the board is so small, then what’s lacking? So, there is no USB/Serial converter (however, it lowers the price also). Because of that we need an additional device for programming it – USB/Serial TTL converter. A sketch needs to be compiled at first (the icon with a triangle) and compiled after that. In order to do it, press the reset button on Arduino Pro Mini and the upload button in Arduino IDE simultaneously (before that, choose the proper board in Tools/Board menu). 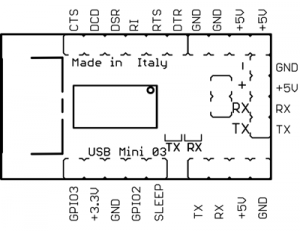 TX i RX on USB Mini will start blinking and the sketch should be on Pro Mini after a while. Since a long time ago, a regular Arduino can be easily programmed by clicking Upload in the IDE with no need for resetting it manually. In the case of Mini boards, often placed in difficult spots, this method is much better. I’ve used Bus Pirate probes here, because I hadn’t any pin headers soldered. 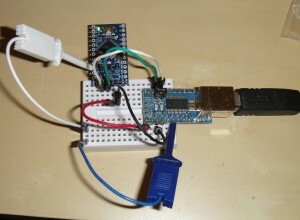 From now on the programming only requires clicking Upload in Arduino IDE.